How we develop, use and arrange our land is critical to achieving the Ontario Vision. Land is a finite and valuable resource. How we use it becomes a key factor in the City’s economic future. As stewards of the land, the City must plan for uses and development that adds value to the community, in terms of function, design and fiscal return. We are steadfast in our Vision, but the Policy Plan is flexible enough to accommodate the evolution of development types. We desire Ontario to have distinct neighborhoods and activity centers; diversity of residential, employment, retail, entertainment, and community and recreational services; and a world-class airport which are connected through a unified mobility system. The Land Use Element reflects Ontario’s Vision to be a complete community. 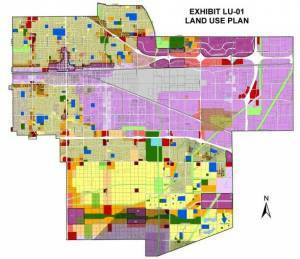 Designates the distribution, location and balance of land uses. Describes building intensity standards for each land use. Ensures compatibility between land uses. Development that supports the Vision will strengthen the City’s economy. New growth will enhance the quality of life in the entire community, including our existing neighborhoods. Land uses and development should be consistent with the Vision while protecting the quality of life in existing neighborhoods. Our development review process should incorporate flexible standards to achieve our Vision. The way land is used and developed will determine our revenue base and expenditures.